Cheap and confortable roadside rooms for Maidstone Town Centre and the Leybourbe area. 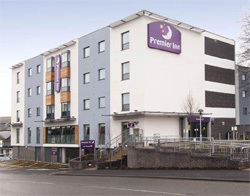 Premier Inn offer generous bed & breakfast package for weary travellers in Kent. Hotels as cheap and reasonable as this are few and far between in Maidstone, so you’ll be pleased to learn that Premier Inn is host to not one, not two but three roadside properties in Maidstone: one in the town centre close to the Railway Station, one in Leybourne (just 10 minutes drive away) and one on London Road. Let’s take a look at each of them in a little more detail. The Town Centre Premier Inn is just 5-minutes walk from the main train station off Tonbridge Road. Rooms at this b&b in Maidstone are a modest but comfortable affair and feature everything from air-conditioning, blackout curtains and Freeview TV to power showers and complimentary toiletries. Guests at the hotel can look forward to a light continental breakfast or a full-on ‘all-you-can-eat’ buffet breakfast at the next door Thyme Restaurant. The riverside Lockmeadow Centre is just 5 minutes’ walk from the Premier Inn, and includes a multiplex cinema and nightclubs. The Premier Inn in Leybourne offers a similarly affordable package. This time its Brewers Fayre Restaurant that satisfies those hungry bellies and ample parking is provided for guests. You’ll find the hotel located in an attractive village setting just off Junction 4 of the M20 between Leybourne Lake and Castle Lake.